She set more than 40 flight altitude records and women's endurance records in gliding and unpowered flight,  [ better source needed ] before and after World War II. In the 1960s, she was sponsored by the West German foreign office as a technical adviser in Ghana and elsewhere,  and founded a gliding school in Ghana, where she worked for Kwame Nkrumah. This listing of flight altitude records are the records set for the highest aeronautical flights conducted in the atmosphere, set since the age of ballooning. Jelenia Góra is a city in Lower Silesia, south-western Poland. Jelenia Góra is located within the Lower Silesian Voivodeship, close to the Krkonoše mountain range running along the Polish-Czech border – ski resorts such as Karpacz and Szklarska Poręba are situated 10 to 15 kilometres from the town. The city constitutes a separate urban gmina and city county, as well as being the seat of surrounding Jelenia Góra County. In 2009 the population of Jelenia Góra was 84,564. The area, including the oldest spa district of Cieplice Śląskie-Zdrój, is one of the most valued recreational and leisure spots in Poland. Kiel University is a university in the city of Kiel, Germany. It was founded in 1665 as the Academia Holsatorum Chiloniensis by Christian Albert, Duke of Holstein-Gottorp and has approximately 27,000 students today. Kiel University is the largest, oldest, and most prestigious in the state of Schleswig-Holstein. Until 1864/66 it was not only the northernmost university in Germany but at the same time the 2nd largest university of Denmark. Faculty, alumni, and researchers of the Kiel University have won 12 Nobel Prizes. Kiel University is a member of the German Universities Excellence Initiative since 2006. The Cluster of Excellence The Future Ocean, which was established in cooperation with the GEOMAR Helmholtz Centre for Ocean Research Kiel in 2006, is internationally recognized. The second Cluster of Excellence "Inflammation at Interfaces" deals with chronic inflammatory diseases. The Kiel Institute for the World Economy is also affiliated with Kiel University. Wolfram Kurt Erhard Hirth was a German gliding pioneer and sailplane designer. He was a co-founder of Schempp-Hirth, still a renowned glider manufacturer. Hornberg is a town in the Ortenaukreis, in western Baden-Württemberg, Germany. It is situated in the Black Forest, 35 km southeast of Offenburg, and 25 km northwest of Villingen-Schwenningen. The Deutsche Forschungsanstalt für Segelflug, or DFS, was formed in 1933 to centralise all gliding activity in Germany, under the directorship of Professor Georgii. It was formed by the nationalisation of the Rhön-Rossitten Gesellschaft (RRG) at Darmstadt. Aerobatics is the practice of flying maneuvers involving aircraft attitudes that are not used in normal flight. Aerobatics are performed in airplanes and gliders for training, recreation, entertainment, and sport. Additionally, some helicopters, such as the MBB Bo 105, are capable of limited aerobatic maneuvers. An example of a fully aerobatic helicopter, capable of performing loops and rolls, is the Westland Lynx. Reitsch was soon captured along with von Greim and the two were interviewed together by U.S. military intelligence officers. When asked about being ordered to leave the Führerbunker on 28 April 1945, Reitsch and von Greim reportedly repeated the same answer: "It was the blackest day when we could not die at our Führer's side." Reitsch also said: "We should all kneel down in reverence and prayer before the altar of the Fatherland." When the interviewers asked what she meant by "Altar of the Fatherland" she answered, "Why, the Führer's bunker in Berlin ..."  She was held for eighteen months. :219 Greim killed himself on 24 May 1945. The Fieseler Fi 103R, code-named Reichenberg, was a late-World War II German manned version of the V-1 flying bomb produced for attacks in which the pilot was likely to be killed or at best to parachute down at the attack site, which were to be carried out by the "Leonidas Squadron", V. Gruppe of the Luftwaffe's Kampfgeschwader 200. The Wasserkuppe (help·info) is a mountain within the German state of Hesse. The elevation, which is a large plateau formation, is the highest peak in the Rhön Mountains. Between the First and Second World Wars great advances in sailplane development took place on the mountain during the interwar period. Near the summit there is still an airfield used by gliding clubs and pilots of light aircraft. Peter Riedel was a German gliding champion, and was Air Attaché for the Nazi government in Washington, D.C., before and during World War II. Between 1977 and 1985 he published the definitive history of the German gliding movement prior to the war. The Messerschmitt Me 328 was originally designed as a parasite aircraft to protect Luftwaffe bomber formations during World War II. During its protracted development, a wide variety of other roles were suggested for it. 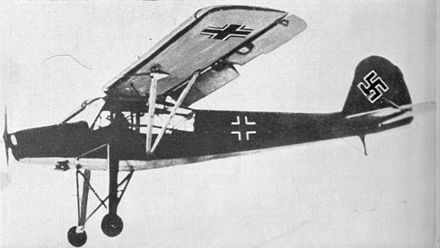 Late in the war, the design was resurrected for consideration as a Selbstopfer aircraft, but was judged unsuitable even for this purpose. The tiny fighter was to have been propelled by pulsejets, but the unsuitability of these engines doomed the Me 328 from the start. Hans Baur was Adolf Hitler's pilot during Hitler's political campaigns of the early 1930s. He later became Hitler's personal pilot and leader of the Reichsregierung squadron. Apprehended by the Soviet Union at the end of World War II in Europe, he was imprisoned in the USSR for ten years before being extradited to France on 10 October 1955, where he was imprisoned until 1957. He died in Herrsching, Bavaria, in 1993. Captain Eric Melrose "Winkle" Brown, CBE, DSC, AFC, Hon FRAeS, RN was a British Royal Navy officer and test pilot who flew 487 types of aircraft, more than anyone else in history. He was also the most-decorated pilot in the history of the Royal Navy. The Rhön-Rossitten Gesellschaft (RRG) or Rhön-Rossitten Society was a German gliding organization, the first one in the world that was officially recognised. The Rhön-Rossitten Gesellschaft was mainly responsible for establishing gliding as a sport, not only in Germany but eventually throughout the world. Melitta Schenk Gräfin von Stauffenberg, born Melitta Schiller, was an aviatrix who served as a test pilot in the Luftwaffe before and during World War II. The DFS Habicht was designed in 1936 by Hans Jacobs as an unlimited aerobatic sailplane, with support provided by the Deutsche Forschungsanstalt für Segelflug. Four planes were made available for the Olympic Games of 1936, where the maneuvers of the Habicht over and literally inside the Olympic stadium enthralled spectators. Ann Courtenay Welch OBE, née Edmonds, was a pilot who received the Gold Air Medal from Fédération Aéronautique Internationale (FAI) for her contributions to the development of four air sports - gliding, hang gliding, paragliding and microlight flying. Karl Koller was a German General der Flieger and the Chief of the General Staff of Nazi Germany's Luftwaffe during World War II. Heini Dittmar was a record-breaking German glider pilot. Rivalen der Luft – ein Segelfliegerfilm is a German movie released in January 1934, which in 1945 got banned by the Allied Control Council as Nazi Propaganda film, although it was later removed from the list of so-called Conditional Films. The Horten H.II Habicht (Hawk) was a German flying wing glider built in Germany in 1935. Four, including one flown mostly as a motorglider, were built. One of the gliders was used to test the aerodynamics of a prototype World War II Horten jet fighter-bomber. ↑ "Hanna Reitsch – Hitlers Fliegerin". ORF . Retrieved 24 August 2017. ↑ Bernhard Rieger, "Hanna Reitsch (1912–1979): The Global Career of a Nazi Celebrity." German History 26.3 (2008): 383–405. 1 2 3 4 5 6 7 8 9 10 11 12 13 14 15 16 17 18 19 20 21 22 23 24 25 26 27 28 29 30 31 32 33 34 35 36 37 38 Reitsch, Hanna (2009). The Sky My Kingdom: Memoirs of the Famous German World War II Test Pilot. Drexel Hill, Pennsylvania: Casemate Publishers. ↑ Shirer, William L., The Rise and Fall of the Third Reich: A History of Nazi Germany , New York: Simon and Schuster, 1960, ISBN 978-0-671-62420-0, p. 1454. ↑ Ziemke 1969, p. 118. ↑ "Hitler's Woman Pilot Seized". New York Times. 10 October 1945. Retrieved 7 July 2008. The question whether Adolf Hitler is dead or alive may be answered by the testimony of Hanna Reitsch, woman Luftwaffe pilot, who was in a Berlin bomb shelter with him a few hours before the Russians captured it. She was arrested in the United States zone of occupation today and is being interrogated. ↑ Hans Dollinger with Hans Adolf Jacobsen, tr. Arnold Pomerans, The Decline and Fall of Nazi Germany and Imperial Japan: A Pictorial History of the Final Days of World War II, New York: Crown, , OCLC 712594, p. 234. ↑ Jean Allman (February 2013). "Phantoms of the Archive: Kwame Nkrumah, a Nazi Pilot named Hanna, and the Contingencies of Postcolonial History-Writing". American Historical Review . 118 (1): 108. doi:10.1093/ahr/118.1.104. ↑ Afua Hirsch (16 April 2012). "Hitler's pilot helped Ghana's women to fly". The Guardian. Retrieved 16 April 2012. ↑ Slater, AE (December 1979 – January 1980). "Obituary". Sailplane & Gliding. British Gliding Association. 30 (6): 302. ↑ Shirley Graham Du Bois to Nkrumah, 28 June 1965, box 3 file 57, Nkrumah Papers, quoted in Allman, "Phantoms of the Archive: Kwame Nkrumah, a Nazi Pilot named Hanna, and the Contingencies of Postcolonial History-Writing", American Historical Review, vol. 118 no. 1 (Feb. 2013) p. 122. ↑ Allman, "Phantoms of the Archive: Kwame Nkrumah, a Nazi Pilot named Hanna, and the Contingencies of Postcolonial History-Writing", American Historical Review, vol. 118 no. 1 (Feb. 2013) pp. 104–5. ↑ Ron Laytner, "The first astronaut: tiny, daring Hanna", The Deseret News 19 February 1981, pp. C1+, p. 12C. ↑ "Hanna Reitsch, 67. A Top German Pilot. Much-Decorated Favorite of Hitler Was Last to Fly Out of Berlin Was Cleared by U.S. Hitler Gave Her Iron Cross in Voluntary Suicide Squad". New York Times. 31 August 1979. Retrieved 7 July 2008. Hanna Reitsch, the leading German female pilot and a much-decorated favorite of Hitler who flew the last plane out of Berlin hours before the city fell in 1945, died Friday at her home in Bonn, West Germany. She was 67 years old. ↑ "Hanna Reitsch, Test Pilot for Hitler". Washington Post. 1 September 1974. Retrieved 7 July 2008. Aviation pioneer Hanna Reitsch, 67, who flew the last plane out of burning Berlin before the fall of the Nazis in 1945, died Aug. 24, the West Germany radio has reported. ↑ "Hitler: The Last Ten Days (1973)". IMDb.com . Retrieved 8 May 2008. ↑ "The Death of Adolf Hitler (1973) (TV)". IMDb.com . Retrieved 8 May 2008. ↑ "Untergang, Der (2004)". IMDb.com . Retrieved 8 May 2008. Wikimedia Commons has media related to Hanna Reitsch .